Last weekend I made fresh pesto with linguine for Emily. 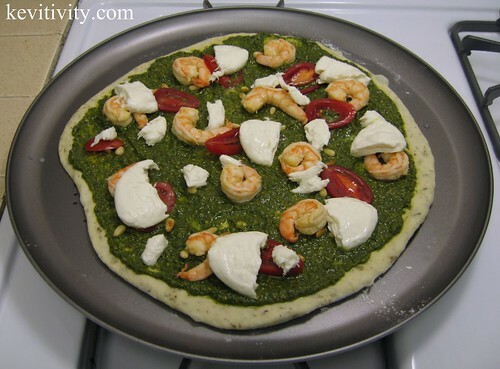 We decided to use the leftover pesto this weekend with some shrimp, baby roma tomatoes and toasted pine nuts for a pizza. Also got some fresh pizza dough. In the end, it was ok… I think I may have over cooked it, and it needed more tomatoes. Everything from Trader Joe’s, including the fresh basil in the pesto. Those baby roma tomatoes were really perfect and sweet… The best pizza pan we’ve found is this Cuisinart 14-Inch Pizza Pan. Basic traditional Pesto – it’s a simple recipe so you *really* need to use good ingredients. * 3 tablespoons pine nuts, toasted. Blend until smooth. Salt to taste. If you use the real deal, fresh “Parmisano Reggiano” (the king of cheese), you may not need to add much salt.